I'll admit it... I've been netdecking. "What is netdecking?" you might ask. Well, netdecking is when you don't want to go through the pain of trial and error in deck construction for a card game, so you go online and look up some of the best decks. Then you recreate them! I'm talking about Hearthstone at the moment, but netdecking applies to any card game with deck building. Since I've been trying to get back into ranked play I'm finding myself needing to netdeck to get anywhere at all. This game used to be newbie friendly, even in ranked play, but it's not as much anymore. Once you get to rank 20 or less (lower numbers are better in Hearthstone) the opponents start to get really good and if you don't have a modern deck with good cards you don't stand much of a chance. I used to be able to get really far in the ranked mode, even with the standard starter decks. I can't imagine what it must be like for someone who is completely new to the game picking it up right now. With the expansions and solo adventure cards there are a ton of cards out there to make great decks. Starting out must be extra difficult these days. This is a big part of why I don't play Hearthstone. Not the whole 'ugh, scrubs winning with decks they didn't make' part, but just how the game and its community focus so much on decks someone else built, rather than making up your own. Plus, I don't think the mechanics are nearly varied or fun enough anyway. I don't like applying an esports mentality to every game I play. TCGs, while yes I want to win, have also been places for me to experiment and do zany things. 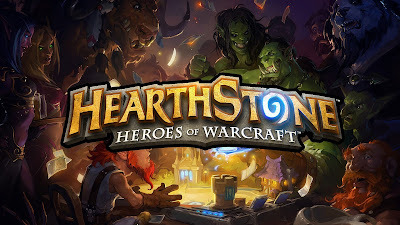 Hearthstone has some of that, but I feel like you get punished for trying too much for it to every be a worthwhile approach to playing the game. The meta game feels fairly settled between expansion releases. Every time I've tried to make my own deck or go too far away from a proven Netdeck I just get destroyed and the game becomes fun. But, my favorite part of CCGs and LCGs is piloting a well constructed deck. That's why I don't actually mind netdecking. Someone else does the hard work of deck construction and I just get to have fun piloting it. I used to scorn netdecking, but it really is the best way to learn the game. And, especially if you play ranked it's the best way to figure out how to win games - by playing a netdeck you'll learn what others playing that deck are trying to do, and you can play around their probable moves. The decks I most enjoy playing are still my own creations, but I think netdecking is a valuable tool. I've noticed that I'm starting to understand other player's decks a lot more now that I'm netdecking. I can tell when other players have a similar deck and what they'll try to accomplish. I like to look at netdecking as a kind of research -- we don't frown upon people looking at guide on raid encounters or how to min/max their chracters, so why is Hearthstone any different? There's still plenty of room for creativity either through casual mode or arena, but netdecking is arguably one of the best ways to progress through ranks. Sure, use a creative deck if you want to (and many legends to) but at least have a look at what is currently strong so you know what to expect should you come up against one. That being said, they really do need to address how quickly the card collections are getting out of control. I love that they're adding new mechanics that are going to freshen it up, but I really feel for anyone who is just starting the game. They should introduce an awesome starter pack or something, and allow you to buy it with a tonne of gold if you'd prefer not to spend anything. Thanks! I think I basically feel the same way about netdecking. I love your idea about giving people an easier on ramp to the game. They really do need to offer an affordable bundle or something for new players.